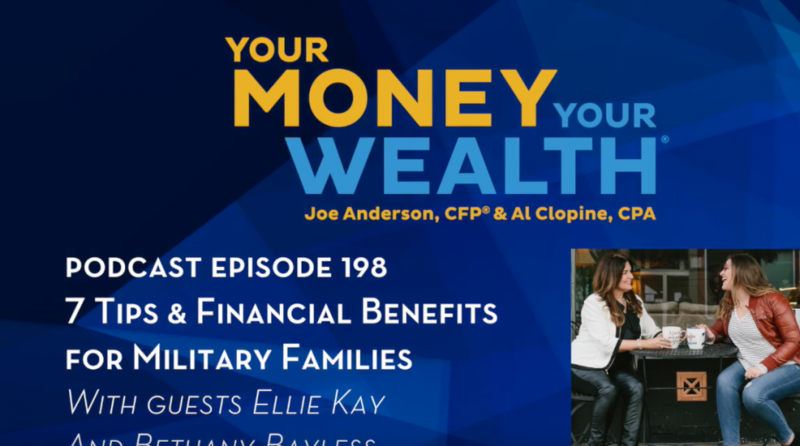 “This week on Your Money, Your Wealth® podcast #198: Ellie Kay and Bethany Bayless (Heroes at Home, The Money Millhouse podcast) share some of the financial challenges America’s military families face that civilians may not think about – along with some tips and benefits to help them make the most of their money. Plus, Joe Anderson, CFP® and Big Al Clopine, CPA answer your money questions: when should you claim Social Security to avoid any changes for the worst that the government might make to the system? Is a Roth 401(k) or a traditional 401(k) better for dealing with taxes and inflation? And, Joe, Al, and producer Andi share their Cyber Monday shopping stories.” — Pure Financial Advisors, Inc.